Women Without Class 1 Edition In this examination of white and Mexican-American girls coming of age in California's Central Valley, Julie Bettie turns class theory on its head and offers new tools for understanding the ways in which class identity is constructed and, at times, fails to be constructed in relationship to color, ethnicity, gender, and sexuality. Documenting the categories of subculture and style that high school students use to explain class and racial/ethnic differences among themselves, Bettie depicts the complex identity performances of contemporary girls. 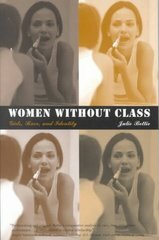 The title, Women Without Class, refers at once to young working-class women who have little cultural capital to enable class mobility, to the fact that class analysis and social theory has remained insufficiently transformed by feminist and ethnic studies, and to the fact that some feminist analysis has itself been complicit in the failure to theorize women as class subjects. Bettie's research and analysis make a case for analytical and political attention to class, but not at the expense of attention to other axes of identity and social formations.